If you’re looking for a spa holiday with unadulterated luxury in a tropical island setting, St Lucia should be high on your list. Of all the islands in the Caribbean, St Lucia may well be the best place to find pampering and sheer indulgence. St Lucia is a haven of magnificent natural beauty. In between the stunning sandy beaches - usually golden in the North, and dark volcanic silver in the south - lies an island of lush rainforest-covered mountains. The weather here is warm and moderate all year round, providing the ideal atmosphere to rest, relax and soak up the island’s wonders. Whether you choose to base yourself in the north or the south of the island, the setting could not be more perfect for a spa holiday. The north is well-developed, with fantastic beaches and an incredible choice of resorts, restaurants and bars. The south offers a more tranquil island experience, where the views are unsurpassed possibly anywhere in the Caribbean. From the the south west corner of the island you can see the majestic green peaks of the two mountains Petit Piton and Gros Piton. This spectacular environment is the home to some of the finest spa resorts in the world. Surrounded by lush landscapes, you can enjoy ultimate luxury that will leave your body and mind pampered and rejuvenated. You can fill your days with excursions and activities, or simply relax and enjoy a thoroughly restorative break, taking advantage of all the wonderful spa treatments on offer. 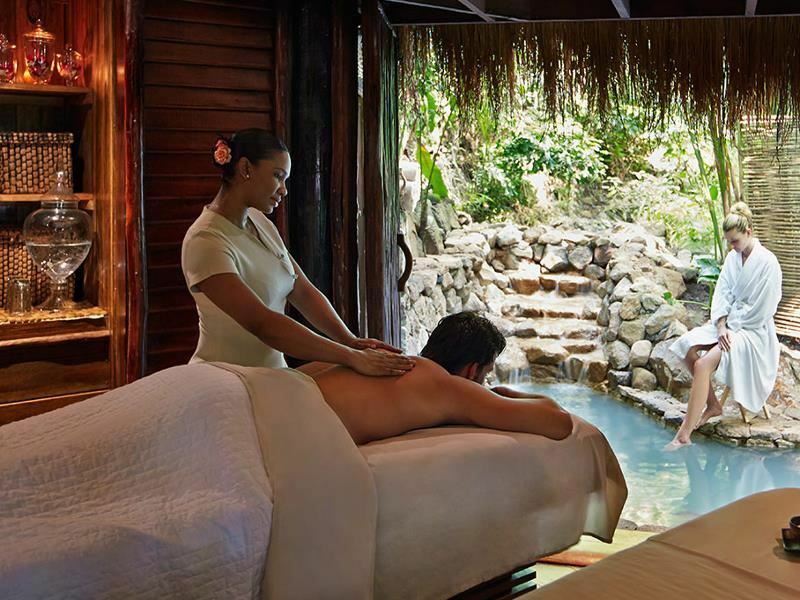 A spa holiday in St Lucia can be as lively or as laid back as you want it to be. The hospitality is second to none, as you’ll find the St Lucian people love sharing the beauty of their island and heritage. One spa resort well worth considering in the north of the island is the world famous The BodyHoliday retreat. Located on the white sands of one of St Lucia’s most idyllic beaches, The BodyHoliday offers the widest range of activities and excursions of anywhere on the island. The wonderful people here make it easy for you to explore and be active. For a serene experience, you can indulge yourself to your heart’s content in The BodyHoliday’s award-winning Wellness Centre. This fabulous centre is not to be overlooked. It offers a huge range of treatments, from Ayurvedic massages to specialist skin consultations. The All Inclusive packages at The BodyHoliday are incredibly generous, offering a spa treatment for every single day of your stay. This means you can do your utmost to try them all. The Hot Stone Massage comes highly recommended. Another fabulous All Inclusive option is the dreamy “Luxury Included” Package on offer at the Sandals Grande St Lucian Spa and Beach Resort. This beautiful resort is well-equipped with its own sumptuous Red Lane Spa, four whirlpools and five swimming pools, including a scuba pool and a swim up bar. Its location in the far north of the island mean it is ideally located to experience the famous Friday night street party of Gros Islet. This cultural celebration of barbecued food, local beer, music and dancing is not to be missed. The following day you can recover in style as you enjoy spa treatments on the beach. You can bask in the sunshine and beauty of the ocean as your therapist massages all your tension away. If you prefer to be based in a more secluded destination, consider checking yourself into the exclusive adult-only Ladera Resort and Spa. 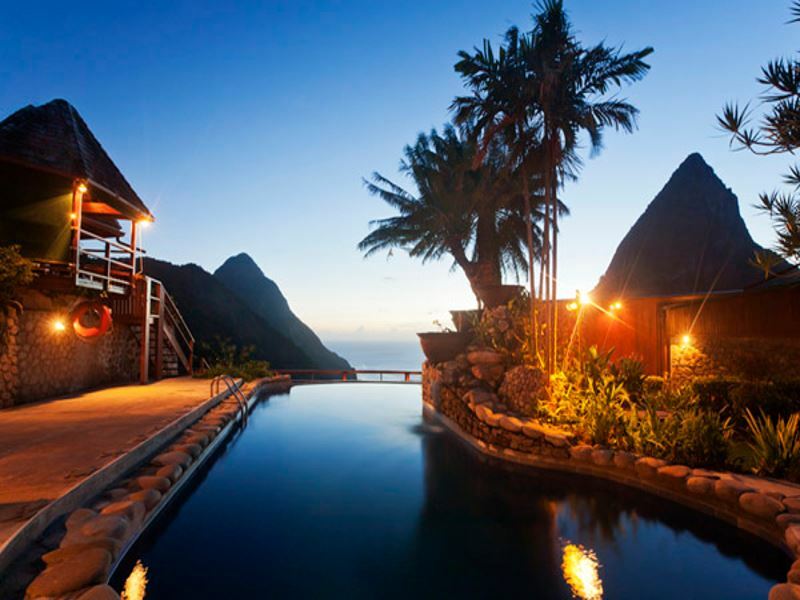 Nestled in the beautiful mountains of the south coast, with panoramic views over the Pitons and the Caribbean sea, Ladera Resort and Spa offers a truly special spa holiday experience. Ladera has been intelligently designed with countless exquisite touches to make it the perfect romantic destination. Every room at Ladera comes with its own plunge pool or heated pool. The resort also boasts the first infinity pool anywhere in the Caribbean. The experience of watching the sunset from here is breathtaking. Your enjoyment of the views, the pools and trips to the beach while at Ladera can be interspersed with pampering treatments at their deluxe spa. They offer a wide range of soothing massages, rejuvenating facials and beautifying manicures and pedicures. Another gem of a resort in the south west of the island is the five star Viceroy Resort of Sugar Beach. Sugar Beach has unmatched views of the Pitons, and as its name suggests is perfectly placed on a beautiful long white sandy beach. You can take in the sublime vistas as you enjoy some Caribbean-style fine dining in one of the resort’s multiple restaurants. Sugar Beach really is the resort for true five star luxury - there is butler service in every room. Although the resort is wonderfully spacious, you can enjoy this without having to even walk between places if you don’t want to - every guest is given a mobile phone to call their butler for shuttle service around the resort. Just a few paces away along the sand is Sugar Beach’s phenomenal Rainforest Spa. Here the therapists take great care to provide you with a highly personalised service. Tell them what you want and they’ll do their utmost to provide it. They’ll even help you to choose your favourite scented oils for their delicious aromatherapy massage. Whichever spa holiday you opt for in St Lucia, this gem of an island will not disappoint. It is easy to understand why many people find themselves returning year after year to recharge their batteries. You will leave feeling truly rejuvenated and nourished, mind, body and soul.